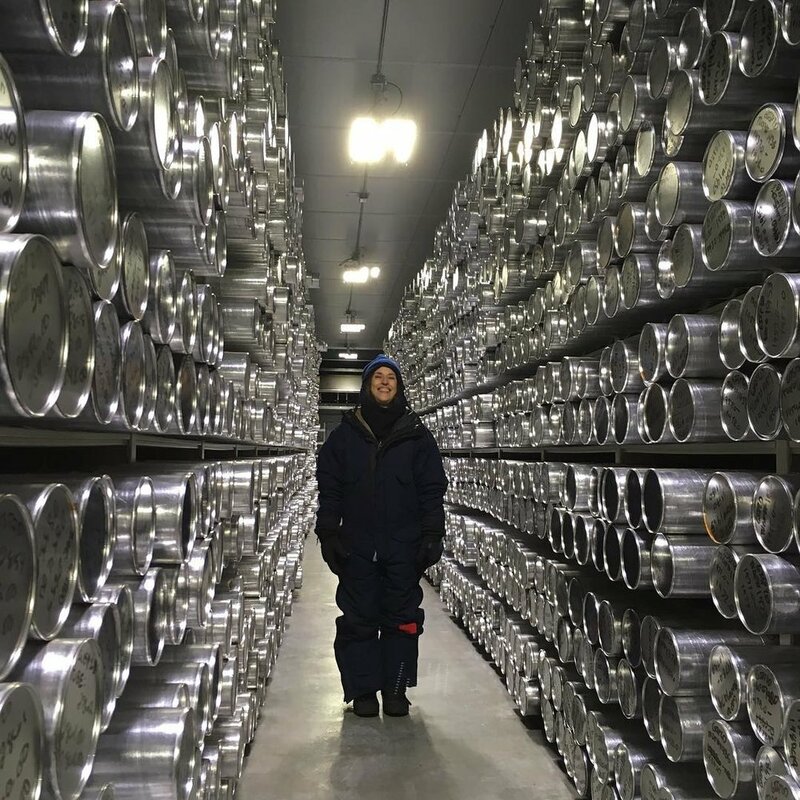 Weil visited frozen ice core repositories at the National Ice Core Laboratory in Denver, Colorado to create 88 Cores. Peggy Weil’s work as an artist and designer spans genres including digital urban signboards, VR, apps, and games. As an original member of the MIT Media Lab, she worked on pioneering interactive projects and has gone on to create award-winning titles including Immersive Journalism projects such as Gone Gitmo, a virtual installation of Guantánamo Prison and Wall Jumpers, a global visualization of political barriers. Weil founded HeadsUP!, a global competition challenging designers to create data visualization of urgent global issues for the public square. Weil’s work has been exhibited and presented at academic, industry, and art venues internationally, including LABoral Centro de Arte y Creación Industrial, Gijón, Spain; Moscow Museum of Modern Art, Moscow; and CURRENT:LA Public Art Biennial, Los Angeles. Weil teaches regularly in art, film, and media programs including those at the University of Southern California, UCLA, and California College of the Arts. She also serves as an advisor to the Los Angeles County Museum of Art’s Art + Technology Lab. 88 Cores is the fourth in a series of underlandscapes by Weil, projects treating solid ground as a canvas of critical processes and phenomena: HeadsUP2012, a data visualization of global groundwater from satellite data; UnderLA, an animated underground landscape of the Los Angeles Aquifer beneath the LA River; and Oscar-Zero, a virtual installation of a nuclear launch control center in North Dakota. She is honored to be working with the Climate Museum in its mission to provide a forum for discussion and action on climate change.